A TWO-HOUR KORAN is condensed and abridged, covering the most important elements of the Koran that concern non-Muslims. Standard Korans are widely known to be difficult to comprehend but this version allows the reader to understand the basics of the Koran in the time it takes to watch a professional sports event. The standard Korans are arranged by length of chapter, not in chronological order and do not include the life of Mohammed for context. These Korans have no time reference, no Mohammed and no story. Therefore, they are difficult to understand. A TWO-HOUR KORAN weaves Mohammed’s life back into the Koran so the verses have context and meaning. Everything is in time order, and the original story has been restored, providing the reader with a taste of Islam. This Koran concentrates on the political verses, or those verses that impact the non-Muslim. Once you have read A TWO-HOUR KORAN, you can pick up any Koran in the bookstore and make sense of what you are reading. I read this “Cliff Notes” version of the Koran, then I reread it and underlined significant passages. My thought, since 9/11, is that main stream conventional wisdom didn’t really tell us a true picture of Islam. What did we all learn in College about the Koran? Academia has told us the Koran is just like the Bible. Educated adults that I have encountered have said the same thing for the last forty years. There is an overlap, but to say the two books are just alike is poor scholarship. The story of Moses is mentioned 39 times in the Koran. I find it particularly instructive that the Koran’s telling of the role of Jesus. ” The Messiah, Jesus, the son of Mary is only Allah’s messenger”. Therefore the role of Jesus, according to the Koran, is to announce the coming of Mohammed in the 7th century. “Far be it from Allah to have a son.” These means that Christians, according to the Koran, have their scripture in error. In the Koran there is one set of rules for the Muslim believer and a different set of rules for the unbeliever. Therefore there is no “Golden Rule” in Islam. I have three books by the premier scholar of the middle east, Bernard Lewis. The writings of Bernard Lewis are a trusted source for people of the middle east. He provides good information, but in a way that is very sympathetic to the Muslim community. Overall it seems the facts of Islam that Academia has presented to us are “sugar coated.” The author. Bill Warner, identifies these Academics as apologists. I think Bill is right on the money. Very informative and easy to read book. I think everyone should read the Koran. We need to know more about the fastest growing religion in the world. It is interesting to know that Islam divides the world in believers and non- believers and how the treatment of these groups are so different. A must read!!! I liked it. Waiting for hard copy to arrive. Based on reviews and a brief scan, this looks like a good tool to help folks understand Orthodox Islam. Christians, Jews and other religious people need to understand why Muslims want to conquer, subjugate, or kill them This will expose some secret doctrines hidden behind the disguise of Arabic language. You don’t have to be an Islamic scholar to understand simple, literal translation and explanation of Mohammed Mutalib’s inconsistent, contradictory, “prophetic” rants. 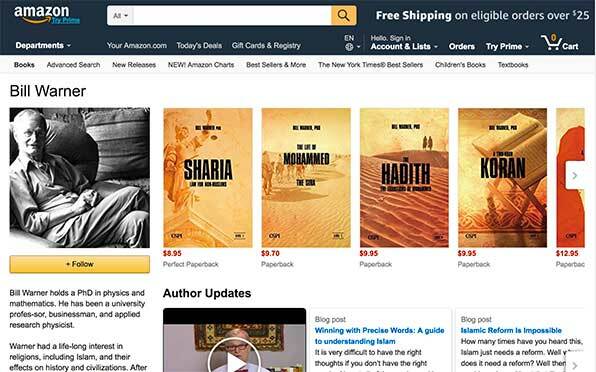 Please, also read other useful items produced by Bill Warner, for help with the Hadith, and Sharia law. You’ll learn things public media, most universities and of course our federal government don’t want you to know. This book is a “Must Read” for anyone who is trying to understand the problems afflicting our World today. Due to it’s brevity and focus, the reader is able to form a beginner’s understanding of the Koran. Most importantly, it make it clear that without knowledge of the Sira and the Hadith, the Koran by itself does not present a complete picture: …..And this work references the appropriate related passages in the other two works. To put it metaphorically, this book is not, by any means, the whole journey: ……But it does provide the reader with an intelligible roadmap. I’ve been watcher Dr. Warner’s video’s for some time and have learned a lot. This was the first book I’ve read, kind of expected a little more. Much if the stuff I already knew from watching his YouTube videos. This book is very informative for those with little or no knowledge of Islam. It is very clear that Islam does not tolerate other religions. People in the United States need to wake up and do their own research about this cult on the rise In America. You won’t hear the truth from the media. Concise and informative. The truth about the real Islam and its hypocrisy. This is an objective book on how to read the Koran. I read the Koran last year. Then I found this helpful booklet as a guide to re-read the Koran (which is organized by chapter length). This book discusses the smattering of a few stories scrambled from the Torah, Prophets mentioned in the Old Testament, (remember this timeframe in within the 700s a.d.) it mentions people in the New Testament, and also teachings in the Persian Zoroasterism. This is a good reference should you wish to know about how Mohammed conquered other tribes, including Arabs who differed, subjugated other peoples, Jews and Christians, took their wealth, accession used based upon Ezekiel and Jesus Christ. Not necessary as some claim, to be read in Arabic to be understood from a pure learning perspective rather than worship – after all we laymen don’t use Hebrew to read the Old Testament, or Greek to read the New Testament. To understand how Islam treats women and Kafirs, this is an excellent booklet. Be sure to check out: […] from Bill Warner’s commentaries and other books available in this series.